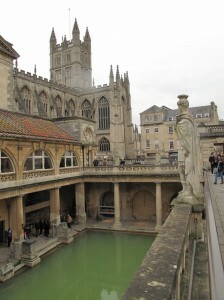 Bath, a UNESCO World Heritage city and home to England’s only hot springs, is an easy day trip from London via train. 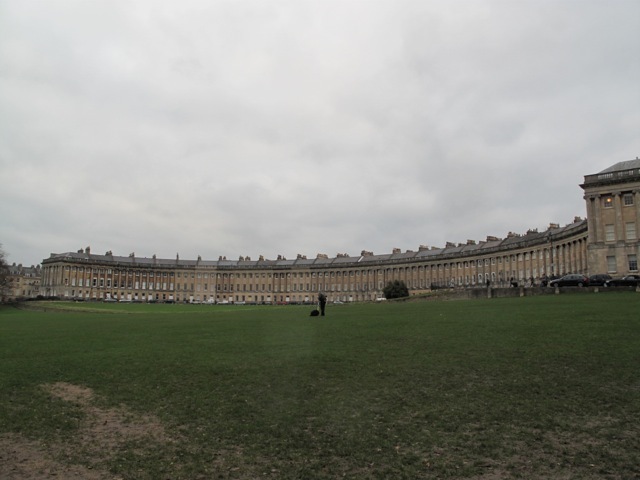 I only spent about six hours in this delightful city—with most of that exploring the Roman Baths and the Thermae Bath Spa’s New Royal Bath, but I hope to return and immerse myself in more than the hot springs. Here’s why: I went to take the waters, but this city won me over with its deep history and rich heritage. Thermae Bath Spa’s New Royal Bath isn’t a fancy or pricey spa, but one that is designed to encourage public support and use. The 92-degree waters contain more than 42 minerals, so I figured a good soak would be beneficial and maybe help counter my jetlag. A two-hour spa session, including the rooftop pool, aroma steam rooms, and Minerva bath, is 26 pounds, add towel, robe, and slippers for an additional 9 pounds or bring your own. I indulged in a massage before soaking in the baths (most massage treatments last 50 minutes and being around 54 pounds; other treatments are available). My Oriental massage combined a variety of techniques, including Lomi Lomi, Swedish, Malay, and Bamboo—I’d like to tell you more about it, but I snoozed happily, awakening refreshed from my jetlag and ready to take the waters. First stop: the rooftop pool, a fine spot for gazing over Bath’s skyline. 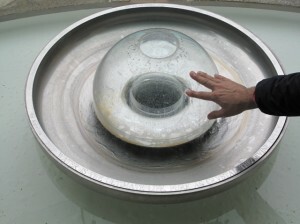 I’m guessing the early Romans didn’t have the glass walls or the bubbling jets–their loss. Next I explored the steam rooms: Each is infused with an essential oil. Also here are footbaths and a rain shower, although I didn’t try either. I finished in the lower level Minerva Bath, the largest of the pools, with a whirlpool and lazy river incorporated into it. By the time my session ended, I was thoroughly cooked and ready for lunch—whoops! that doesn’t sound quite right—I was completely relaxed and looking forward to having lunch. Before assuaging my hunger, I peeked inside the separate Cross Bath (priced separately), a sacred site within the World Wildlife Fund for Nature’s Sacred Land Project. This small, outdoor soaking pool on the site of the original 2,000-year-old Roman cistern. 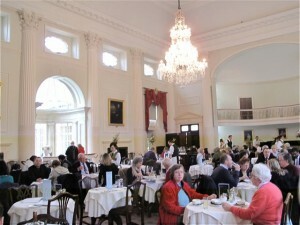 For lunch, I dined at The Pump Room, an exquisite, and elegant and impressive Georgian retreat built by Thomas Baldwin and John Palmer in 1795. A pianist played recognizable tunes, such as Memories from the musical Cats, throughout the meal. My soup-and-sandwich special — tomato and basil soup paired with a Quikes cheddar and Abbey ale rarebit accompanied by a small salad and chips — was okay, but didn’t the setting. As I finished, tea service was starting. Now that I’d return for–those silver tiered trays of sweets and sandwiches get me every time. 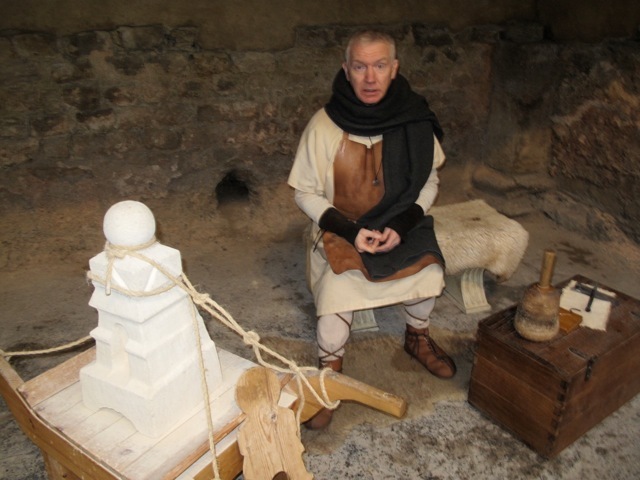 Sharing the same building as the restaurant is the visitor center for the city’s historic Roman Baths, developed more than 2,000 years ago. Both live tours and audio guides (including one for children) are available and included in the admission price (about 13 pounds). While this current structure dates from the Romans, truth is, long before they arrived and created Aquae Sulis in AD 43, the Celts dedicated the mineral-rich springs to their God, Sul, and before them, Prince Bladud was allegedly cured of skin disease by bathing here way, way, waaaayyyy back in 863 BC. (Just think on that a bit—863 years before the birth of Chris). Don’t shortchange yourself here; I only allowed myself about a half hour, which was no where near enough to wander through with an audio tour. I easily could have spent an hour or more, but then, I really do love historic ruins. And these are especially well presented, with excellent signage explaining everything from creation to curses. I even came across a few Romans. I soaked up more of Bath’s history and heritage on a walking tour with Jan Hudson, a Blue Badge tour guide for the whole of South West England, but, as she said: “Why would you want to be anywhere else but here?” She proved a delightful and extremely knowledgeable guide. (Note to self: Always ask for a Blue Badge Tour Guide—each guide who earns that status has gone through a rigorous training and testing program). We covered a lot of ground in a short time, as Jan pointed out the city’s architectural distinctions, historical sites, and wove in stories as we padded–quickly–along, checking out the river and the bridge and getting the lowdown on the city’s first developers. She explained the history behind two residential areas. The 1774 Circus, modeled after the Coliseum in Room, comprises 33 houses, each five stories high and adorned with three types of columns: Corinthian, Ionic, and Doric (Nicholas Cage owned #7 and had a pool in the basement, she quipped). The Royal Crescent, comprising 30 rowhouses with 114 Ionic columns, is considered perhaps the greatest example of Georgian architecture in England. And here’s a tidbit, although you’d never know it from the exterior—it’s in a World Heritage Site, so it can’t advertise–two of the Royal Crescent buildings house the Royal Crescent Hotel, a Relais and Chateau-member luxury inn. My short day didn’t allow me enough time to enjoy any of the museums and historical sites that demanded attention. 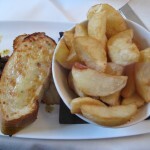 Next time I visit Bath, England, I’ll spend more time at the Jane Austen Centre, the Fashion Museum, and of course, Bath Abbey, a masterpiece that I barely had time to duck into for a peek, and I’ll be sure to indulge in a Sally Lunn bun, a taste of Bath’s heritage served in the city’s oldest house. Tags: Bath, Roman Baths, Thermae Baths. Bookmark the permalink.